Attleboro is looking to bounce back from a five-win season in 2017 and make a push up the league standings by mixing experienced players with a talented group of underclassmen that could make instant contributions for the Bombardiers. The midfield will be a strength for the Bombardiers this season with returning starters like senior Kyra Lyons and junior Anna Back. Up front, leading scorer Grace Mayer graduated but senior Alex Compton was second on the team in points and will be counted on to fire in the goals. Attleboro will be hoping for more consistency from the defensive group this season to cut down on the 76 goals it allowed last year and senior goalie Shealyn Harrison will help keep things organized. Davenport division champion Canton went to overtime against top seed Somerset Berkeley in last year’s Div. 1 South semifinal and was a goal away from setting up an all-Hock final. The Bulldogs bring back a lot of talent from last year’s squad and will be hoping to make a run at back-to-back titles. Senior forward Maggie Malloy will once again be the focal point up top after leading the Bulldogs with 27 goals and eight assists last fall. Malloy will be joined up top by sophomore Maria Femia. Junior Kaitlyn Goyetch, the reigning HockomockSports.com Underclassman of the Year, is back in the midfield and she will get helped out by sophomore Meghan Labelle. Senior Katie Trerice will be the leader of the defense and sophomore Rose Malloy will jump in and contribute as well. Sophomore Riley O’Connor will take over in goal this fall. 2017 Finish: Reached Div. 2 South Semifinal. With 14 seniors on the roster this season, Foxboro has set its sights on regaining the Davenport division crown that it lost by just two points to Canton last year. Two years removed from winning the Div. 2 South title, the Warriors seem poised to make another deep tournament run with a team loaded with talent, depth, and experience. Senior forward Lily Daly, the team’s leading scorer each of the past three seasons, will once again team up with classmate Sophia DiCenso to form one of the league’s most dynamic attacking units. Senior Molly Murphy and junior Jamie Notarangelo will add to an already formidable offense. Senior Meghan Curran will lead the midfield unit along with classmate Carly Stern and the defense will be guided by seniors Caroline McGeary and Kristin Whalen, while senior goalie Julia Carangelo. After come narrowly short of the league title last season and reaching the sectional semifinal, expectations are typically sky high for one of the league’s perennial powers. Michelle Hess returns to the Franklin bench this season after eight years away from the program and she inherits a team that has the talent to compete for a league title and expectations of being able to make a deep run in the state tournament as well. Senior midfielder Cassi Ronan is the primary playmaker for the Panthers and was the team’s leading scorer last fall with 16 goals and eight assists. One of the league’s top players, Ronan will be the primary focus of the opposition, but senior Regan Paterson can take some of that pressure off and will chip in with goals from the forward position. Senior Emily Valentino and junior Maeve Ledwith will provide organization for the defensive unit and senior Christina Luccini will be back in goal to backstop the defense. “We are looking to improve on last years record and would love to go further in the tournament,” said Hess. 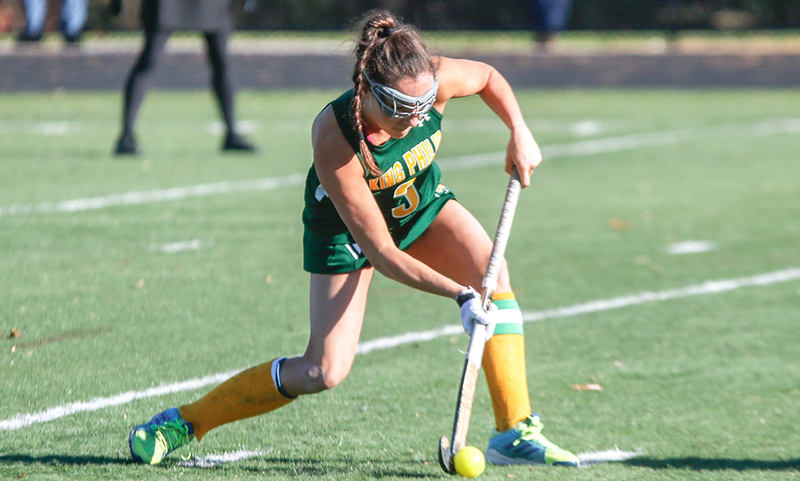 King Philip had a dominating run through the 2017 season, winning the Kelley-Rex title while losing just two games in the Hock all season, and then claiming the Div. 1 South title for the first time. This year, KP has a new coaching staff, with Kimberly Meehan and Erin MacDonald taking over the reigns, and high expectations with an experienced and talented roster. The Warriors return six seniors, who will be counted on to keep the team focused in its quest for a second straight title. Alli Meehan will be the primary attacking threat again this season. The Northeastern University-commit scored 40 points last regular season, despite missing a couple of games. Senior Claire Lawlor will be on the left wing to support the attack, and senior Nicole Conner will jump into the attack from her midfield position as well. Three-year starter Dana Truini will run the midfield for the Warriors, providing support on both ends of the field. Defensively, senior Emma Izydorczak, a St. Anselm-commit, will be the leader of the back line to keep things organized. Fellow senior Kate Lindmark will also help out for a defense that last year allowed only 13 goals in 23 games. Mansfield reached the state tournament again last year and was the only team in the league to beat Kelley-Rex champion King Philip (twice, in fact), but the Hornets have their sights set on returning to the top of the league standings as they did in 2014 and 2015. With a balanced roster that has depth all over the field, the Hornets have a chance to unseat KP in the division. The Hornets have 10 seniors and experience all over the field. The forward line will include seniors Lauren Clang, Tori Farrington, Alicia Hottleman, Brooke Downy and Hayleigh Crawford. The midfield unit will be led by seniors Maggie Danehy and Kelly Doherty, who showed her versatility last season in several positions. Senior goalie Kayla Hunter is also back to help keep the defense solid. Newcomers like sophomore forward Abby Varricchione and sophomore midfielder Stori Rounds will jump in and contribute as well. New head coach Katie Blackburn will try to improve on Milford’s three wins from last season with a group that has a lot of experience, especially on the back line, and speedy forward line that will try to fire in the goals. The defense is filled with upperclassmen with seniors Eliza Valente and Emily Haley anchoring the back line along with junior Paige Reisman. Juniors Bella Gonzalez and Kathryn Swineford will be key players in the midfield and sophomore Madison Carneiro is a player to watch in the Milford front line, which Blackburn said would include a number of players that have a variety of skill sets. North Attleboro got back into the state tournament last fall, only to run into perennial power Walpole in the second round, and the Rocketeers have a deep roster to make another run this year and potentially challenge Canton and Foxboro at the top of the Davenport. The new turf at Beaupre Field should also help North utilize the team’s speed. The Rocketeers have a ton of experience coming back this season, including seniors Abby Calistra, Julia Feid, Shaylee Maxcy, and Lizzie Frost, who will form a solid defensive corps in front of junior goalie Emma Strachan, who head coach Karen Folan said has improved her quickness in the off-season. Speedy midfielders Michelle Pothier and fellow junior Lindsay Robinson will join senior Jess Strachan, while senior Tara Nair and junior Faith Graveline will be up top. 2017 Finish: Reached Div. 1 South Preliminary Round. Oliver Ames is coming off a strong regular season performance, tying for third place in the Kelley-Rex division with 18 points, but they had to go on the road to Taunton in the playoffs and lost an overtime heartbreaker. First-year coach Sharon Lawrence takes over this season and has a roster with 11 juniors and seniors to try and make another run at a postseason bid. Senior Meghan Rockey is one of the players that the Tigers will turn to this year and she will try to control the middle of the field. Fellow senior Kayla Lozzi can step in at forward or midfield and scored 10 points (four goals and six assists) for OA last season, while senior Samantha Clapp adds a defensive presence whether in midfield or defense. Lawrence is also excited for the contributions from the younger players, including sophomore forward Hannah Stryke, who is the Tigers top returning scorer with seven goals and four assists as a freshman. First-year head coach Ashley Courville is looking to build the program from the ground up, and she is counting on a large roster and a core of returning players to get Sharon moving in the right direction this season. With only one sophomore on the roster, experience shouldn’t be an issue for the Eagles as they turn things around. The defense will be led seniors Varsha Poreddy and Rebecca Clayman. Junior Blaize Hanna will also be part of that group this fall. The midfield has seniors Georgia Cheney and Lauren Yaffe to help out in the attack and also chip in on the defensive side of things. Sophomore Lauren Prenaveau is another player to watch in the Eagles midfield. Up top, senior forward Elizabeth Romantz will be counted on to add to Sharon’s goal tally. Stoughton graduated 13 players from last year’s team and then lost leading scorer Julia Russell to a knee injury, but there is hope for the Black Knights to make a run at a state tournament spot as the inexperienced players gain valuable minutes at the varsity level. Defense will be a strength for Stoughton this fall, with returning seniors Katie Widrow and Jeanna Girolamo adding stability and keeping things organized at the back. Sophomore Kayla Lobby will start in goal for the Black Knights. In the midfield, senior Jordan Lyons is a strong two-way player and she will be looking to get the ball forward to the sticks of seniors Allie Howe and Alanna McCormick, who will both be trying to make up for the production that was expected from Russell. Taunton had one of its best seasons in program history last year, winning 11 games and advancing in the playoffs for the first time by beating Oliver Ames in an overtime thriller. The Tigers will look to build on that success and compete with the top teams in the ultra-competitive Kelley-Rex division. The Taunton midfield will be a strength this season, as it is filled with experienced players. Seniors Jillian Pagliuca, Lauren Torres, and Mabel Smith are all capable of making plays on both ends of the field and all read the game well to keep the Tigers moving in the right direction. Senior forward Ciera Bartel will be joined up front by last year’s playoff hero Alana Tavares. The sophomore forward scored the game-winner against OA and has the speed to cause defense lots of problems. The Tigers defense will be led by junior Kathryn Robinson and sophomore Jocelyn Pagliuca and if anyone gets through then senior goalie Emma Sheehan will be there to stop them. King Philip, 4 @ Franklin, 0 – Final (5.5 inn.) – King Philip got off to a strong start with three runs in the first inning. Sydney Phillips and Hailey McCasland each had two hits for King Philip while Elise Pereira gave up just one hit in five innings of work. Meg Caron had Franklin’s hit while Emily Valentino struck out two while scattering seven hits in six innings. The game was called after 5.5 innings due to lightning. Mansfield, 2 @ Oliver Ames, 6 – Final – Oliver Ames freshman Emma Varella allowed just two runs, striking out two, in a complete game effort to help the Tigers beat Mansfield. Caroline Mahoney was 3-for-4 with a double, an RBI and two runs scored, Kayla Georgeu was 1-for-2 with a double and an RBI, and Katie Mills went 1-for-3 with two RBI and a run scored. Sarah Tetrault brought in two runs with a sac fly to right in the bottom of the sixth to extend the Tigers lead to five. Sharon, 2 @ Ursuline Academy, 7 – Final (6 Inn.) – The game was called an inning early due to lightning. Oliver Ames, 7 @ Ursuline Academy, 12 – Final – Emalyn Duvall scored two goals for the Tigers while Olivia Piazza, Chloe Kilkelly, Kayla Lozzi, Olivia Carroll and Ella Hogan each tallied one goal. Taunton, 4 @ Durfee, 1 – Final – Taunton swept singles play and grabbed another win in doubles play to beat Durfee. Francois Hennaux won 6-1, 7-6 at first singles, Brett Beaulieu earned a 6-2, 5-5 (weather) win at second singles, Mike Briggs won 6-3, 6-4 at third singles, and the team of Charlie Fiske and Dylan Kylas picked up a 6-2, 6-3 win at first doubles. Foxboro, 5 vs. Dighton-Rehoboth, 0 – Final – Foxboro picked up its second sweep of Dighton-Rehoboth in a week’s time, this time defending home court. Sophia Prinos (first singles), Pamela Nelson (second), and the team of Olivia Dantona and Kendall Milender (second doubles) all won 6-0, 6-0, Kayla Prag picked up a 6-0, 6-1 win at third singles, and the team of Julia Muise and Sarah Prag notched a 6-1, 6-1 win at first doubles for the Warriors. Taunton, 5 vs. Durfee, 0 – Final – Taunton lost just three games in its three singles matches and just two games in its two doubles matches to beat Durfee. Jillian Pagliuca won 6-2, 6-0 at first singles, Vanessa Rosa earned a 6-1, 6-0 win at second singles, and Jocelyn Pagliuca didn’t lose a game in a sweep at third singles. The team of Samantha Martin and McKenzie Lucie won 6-0, 6-2 at first singles and Amanda Pugh and Brianna Fevrier teamed up to earn a 6-0, 6-0 win at second doubles. Mansfield, 90 @ Oliver Ames, 18 – Final – Jareme DiLorenzo won a pair of events to help the Hornets win a rain-shortened meet against OA. DiLorenzo was first in the 100M hurdles (15.1) and won the triple jump (42′ 5.5″) to pace Mansfield. Stoughton @ Canton – Postponed to Thursday, 5/17 at 3:45. Mansfield, 78 @ Oliver Ames, 48 – Final – Mansfield’s Amanda Mangano had a day to remember, breaking a school record, setting two PRs, and winning three events in the Hornets’ win over OA. Mangano clocked in at 12.0 in the 100M to break the school record, set another PR in the long jump (17’7), and took first in the high jump (5’2). Madison Haughey had a PR in the 100M hurdles with a winning time of 15.7. Haughey also placed second in the high jump and third in triple jump. Julia Hill won the triple jump (34’10), had a PR in the 400M hurdles (68.6) for second place, and took second in the long jump (15’11). Lily Goulding had a 3′ 2″ PR for a first place throw of 103’2 in the javelin. NORTH EASTON, Mass. – It was only five minutes into the game, and Oliver Ames had the ball in the attacking half for most of that time, but Tigers’ second-year head coach Abby Tepper didn’t like what she saw, and burned one of her timeouts. The result of the timeout was a spirited effort from the Tigers, scoring four goals in the next 20 minutes and walking away from Muscato Stadium with a 5-0 decision over visiting Milford. OA created two great scoring chances just moments after the timeout. Junior Kayla Lozzi fed Liz Nuss up the middle, but Milford’s Emily Haley made a nice defensive play just in front of goal. A minute later, freshman Hannah Stryke ripped a shot that was tipped by Nuss, but Milford keeper Paige Reisman made the stop. The Tigers kept up the pressure, earning their third corner of the game just over the midway point of the first half. Freshman Emily Han connected with Sarah Stevens on the corner, who passed back to Cristina Boudreau. The senior ripped a shot from distance and found the back of the net to make it 1-0. The goal seemed to give Oliver Ames more confidence, as they kept pressuring the Hawks. Just two minutes after the opening tally, sophomore Maura Kiernan was in the right place in front of goal, getting a slid touch on Stevens’ long shot, deflecting it into the cage to make it 2-0. OA added another goal just a minute later, converting on another one of their eight first half corner chances. This time, junior Meaghan Rockey found Boudreau for a shot. With Stryke perfectly positioned for a screen, Boudreau’s shot found its way through traffic and into the back of the net. The Tigers capped their first half scoring with just over five minutes to play in the first half. Boudreau carried possession up the right side of the field and then drilled a cross through the area to the back post. Junior Katie Bosse corralled the pass and then placed her shot into the back of the net to make it 4-0. Oliver Ames controlled the second half as well, earning 10 corners and putting 11 shots on net, but only converted once. Five minutes into the second half, the Tigers earned a penalty stroke when the ball was covered in the area. Lozzi took the shot and drilled into to the left side of the cage to make it 5-0. Milford had chances on the counter-attack, especially with the speed of senior Shannon Cormier. But Oliver Ames’ defense played a high line and continually thwarted the Scarlet Hawks’ attempts to break out. The Hawks finally did break out in the 54th minute, registering their first chance on goal. Bella Gonzalez sent a pass in behind the defense that Cormier raced onto, but Oliver Ames goalie Caitlin Grant came charging out and made a sliding save, double stacking her pads. Milford earned its first corner of the game in the final minutes but OA’s defense denied a scoring chance. 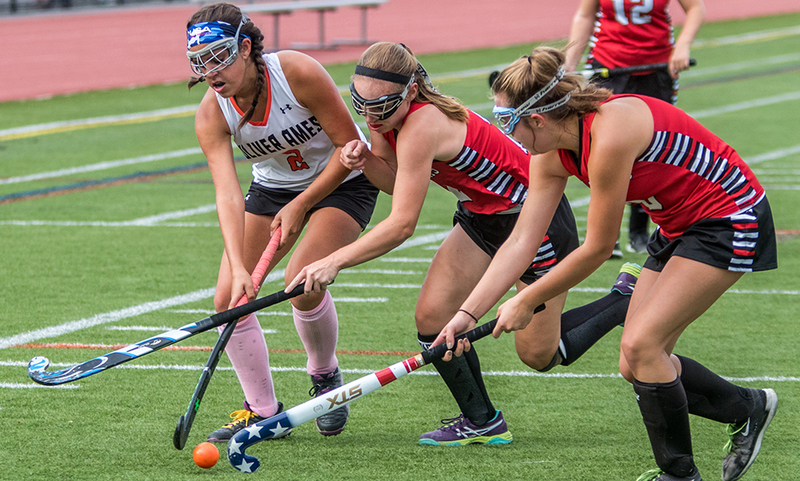 Oliver Ames field hockey (7-1-2 overall, 6-1-2 Hockomock) returns to action on Tuesday when Tepper makes her first trip back to her alma mater, Foxboro. Milford (2-7-0, 2-7-0) will try to bounce back when it entertains Attleboro on the same day.